How come there aren't more jam cocktails? Mixing jam and booze is possibly the best more underrated idea ever. 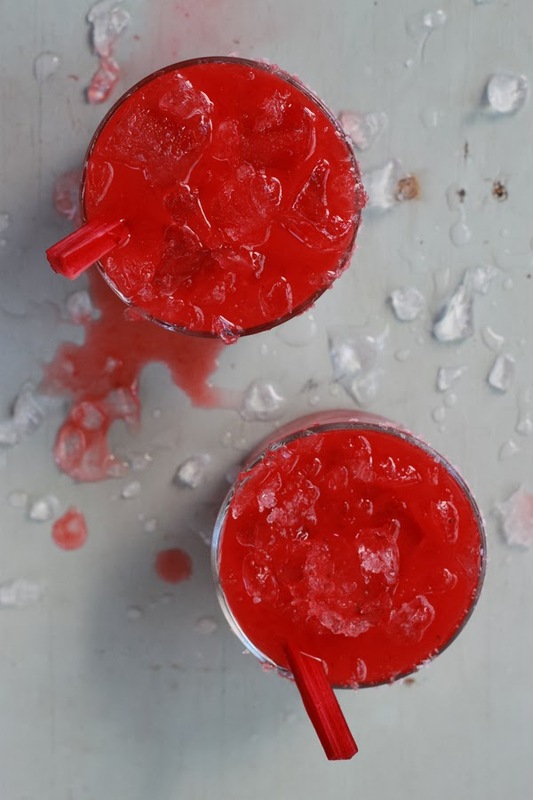 May I present you the easiest spring margarita of all time - the Rhubarb Strawberry Margarita. The cool thing about this recipe is you could switch out almost any jam for the Quick Rhubarb Strawberry Jam and have a killer cocktail. Just strawberry jam? 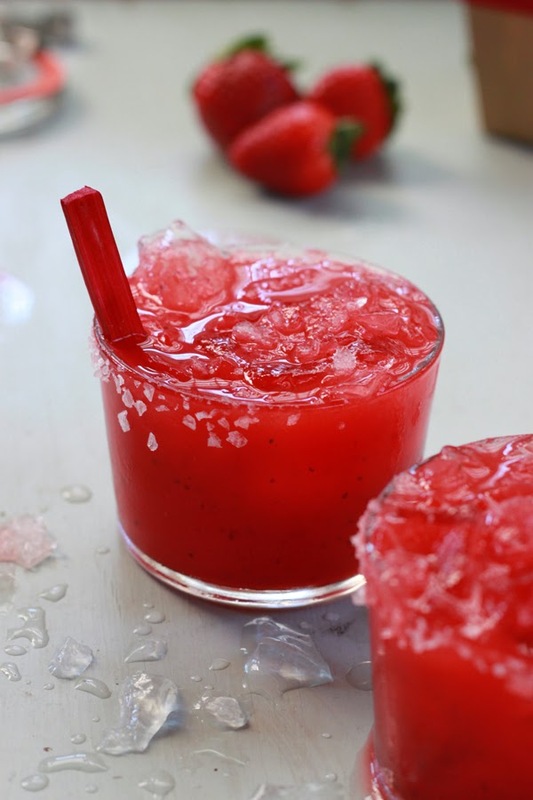 Strawberry Margarita! Peach jelly? Peach Margarita! Rim 4 rocks glasses with either an extra strawberry or lime wedge and dip in a bit of salt. Fill the glasses with crushed ice and set aside. Stir together the jam, lime juice, cointreau, and tequila in a large pitcher breaking up the jam as much as possible. Add the ice, stir and pour into prepared glasses. I know! We should make cocktail delivery a thing. Whaaaaaat?! I didn't need to know this. Tequila makes me kind of evil, but a margarita is my all time favorite summer drink. I missed out on lots of them last year...must make up for lost time. Tequila and I are totally frenemies. I think a margarita is a perfect summer cocktail! 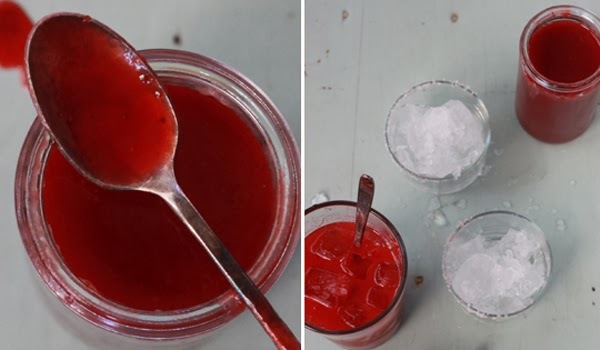 I have attempted making cocktails using jam/jelly before, but always found that it was too thick to properly mix in (microwaving the jam plus a bit of water helped a little bit). Did you use this particular jam fresh, before it had even set up, or do you have another trick for getting it to properly integrate? one thing I've noticed is using store-bought versus home made jams and the amount of pectin in each. This jam doesn't have a thickener at all so the ice and liquor break it down pretty quickly. Smucker for instance has added pectin to make it thick. Maybe try shaking the drink in a cocktail shaker next time to really break up the jam. Thank you - I am so looking forward to warmer weather!